The Swingline™ CHS10-30 is perfect for shredding highly sensitive documents; features the industry's highest security rating of 6. The high security shredder is TAA compliant and shreds paper. The Swingline™ shredder's cut size is minute enough that no one can assemble it together. 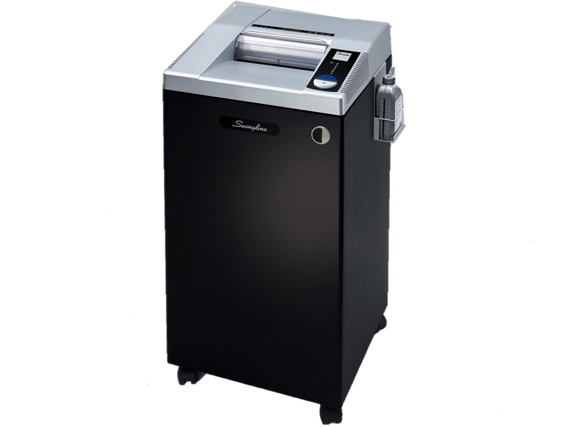 The Swingline™ CHS10-30 high security shredder features auto reverse during a paper jam; with manual reverse available. The JamStopper® shredder automatically oils the cutting blades; ensuring long lasting performance. The JamStopper® shredder comes with thermal overload protection, and the Swingline™ shredder will shred continuously without heating up. Plastic or paper bag can be used in the Swingline™ CHS10-30 high security shredder's wire frame waste bin. The Swingline™ shredder's bin full indicator ensures the bin doesn't get overloaded. High security level makes it perfect for shredding confidential and strategic documents. Automatic oiling of blades ensures longer lasting blades. Cut Size 1/32" x 3/16"